According to a recent news article in the Boston Globe, a cable company worker suffered a head injury while on the job. He was working on a ladder two stories above the ground when he suddenly fell. He hit a retaining wall during his two-story fall and received a serious injury. The employee was rushed to a local Boston hospital following his workplace accident. His condition has not been released, and authorities do not yet know what caused the fall to occur. As our Boston attorneys who represent clients injured on the job can discuss, one of the main differences between a workers’ compensation claim and negligence lawsuit is that the worker is not required to prove that the accident was his or her employer’s fault in order to financially recover. In a traditional negligence lawsuit, the injured worker could only recover if he could prove by a preponderance of the evidence that someone else was at fault for the accident that caused his personal injury. Sometimes a case can be filed against the employer if the employer did not provide proper safety equipment or follow guidelines established by the Occupational Safety and Health Administration (OSHA). In some cases, there can be an action against a person who negligently caused the employee to fall. 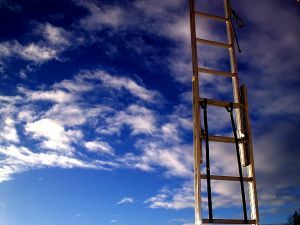 In some instances, the plaintiff may assert that the ladder or other equipment used was defective, and that defect was the reason for the accident. In a workers’ compensation action, if the employee can establish that he or she was injured while on the job, that should be enough to recover, regardless of whether anyone was acting negligent. It should be noted, however, that it is still a complicated process to recover in a workers’ compensation action. Even though liability is not at issue, workers’ compensation insurance companies will often argue about the extent of the employee’s injuries and if they really prevent the employee form returning to work. If you have been injured on the job in Boston, your attorney can use your medical records, testimony of witnesses, and state statutes to establish the extent of your injuries, so that you have a greater chance of receiving a full and appropriate financial recovery. Keep in mind that it is often the workers’ compensation claim that may oppose your claim even if your employer is on your side and agrees that you should be entitled to workers’ compensation benefits. The law requires every employer to maintain workers’ compensation coverage, or in some instances, pay into a state fund. These insurance companies, and state fund managers, are often far more interested in paying out as little in claims as possible than they are about the needs of worker who was injured on the job. One of the other differences between workers’ compensation and a civil action is that, in a workers’ compensation claim, while it may be easier to recover, the recovery is generally limited to medical bills and lost wages. In a civil lawsuit, the plaintiff could potentially recover for pain and suffering, as well as many other types of special damages.